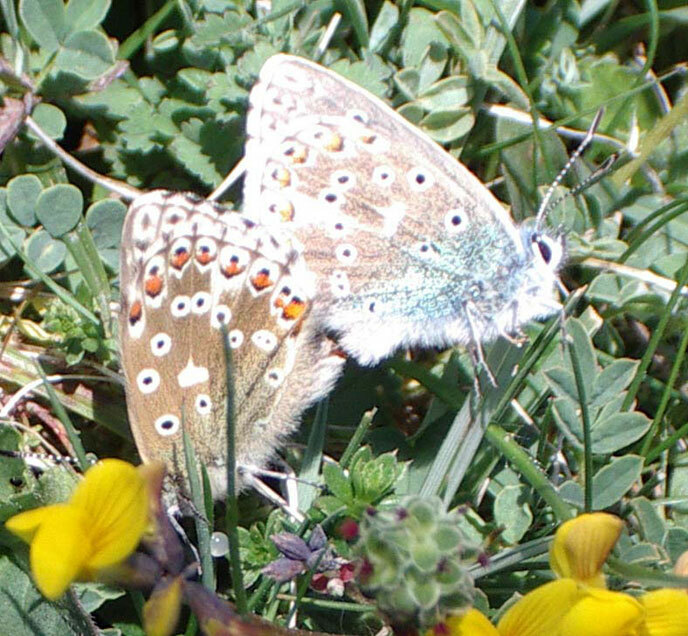 Shoreham Bank (Mill Hill) is the most nationally famous of the Sussex butterfly sites. 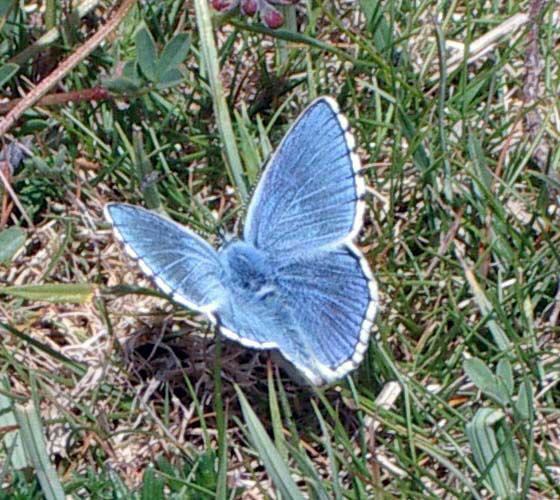 This fame was created by the huge numbers and aberrations of the Chalkhill Blue Butterflies. The fame started from about 1820 when butterfly collecting became the vogue. During the heyday of butterfly collecting between the two World Wars, the private site was kept a secret by commercial collectors. In 1938 the area of Mill Hill and other downland was presented to the people of Shoreham, some 724 acres, although less than 28* acres remain as public open land. It was rediscovered in 1955. (*may be 30 acres). It was rediscovered by butterfly enthusiasts in 1955. 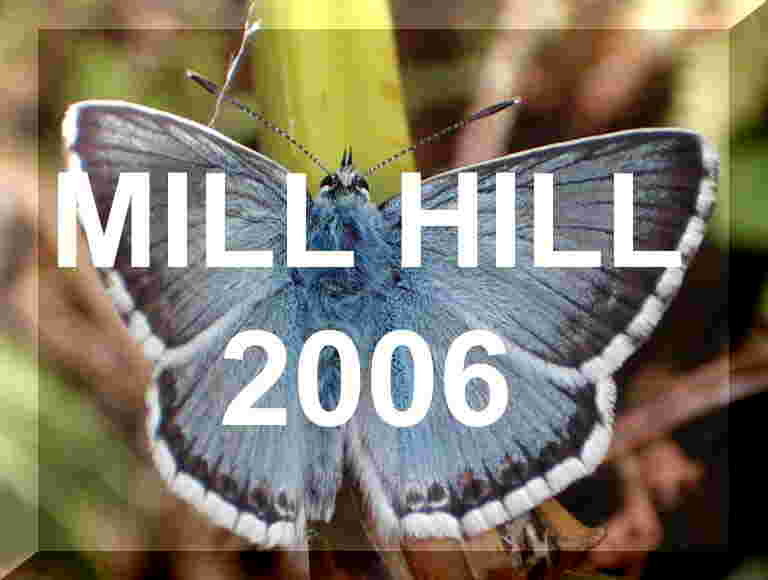 Despite the large number of collectors, they did NOT cause the decline of butterflies on Mill Hill but the demise of the rabbit through myxomatosis and the invasion of scrub through the absence of the rabbit. This disease arrived in 1954, but in the cold winter of 1963, the hill was still almost devoid of scrub. The main invasion of woodland and scrub occurred since the mid-1960s. In the 1950s (before my time) the area was fenced off and the upper slopes were grazed with cattle. The area was grazed right down and only Ragwort remained (like the fields adjoining nowadays). This seemed to have encouraged Hawthorn scrub, Dogwood and Creeping Thistles which remain today. 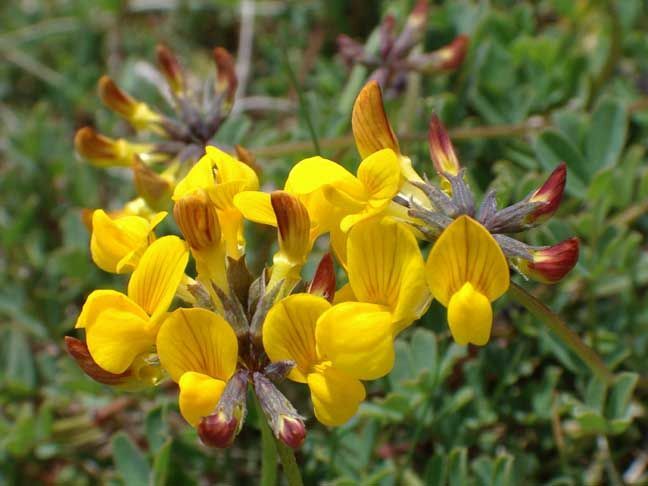 The reports from butterfly collectors said that all the Horseshoe Vetch and wild flowers had been lost from the upper slopes. This remains the case in 2003, although there are now large swathes of longer grass and Scabious, Greater Knapweed, etc. The lower steeper slopes were fenced off and this is still a continuous mat of Horseshoe Vetch with incursions of Wild Privet. 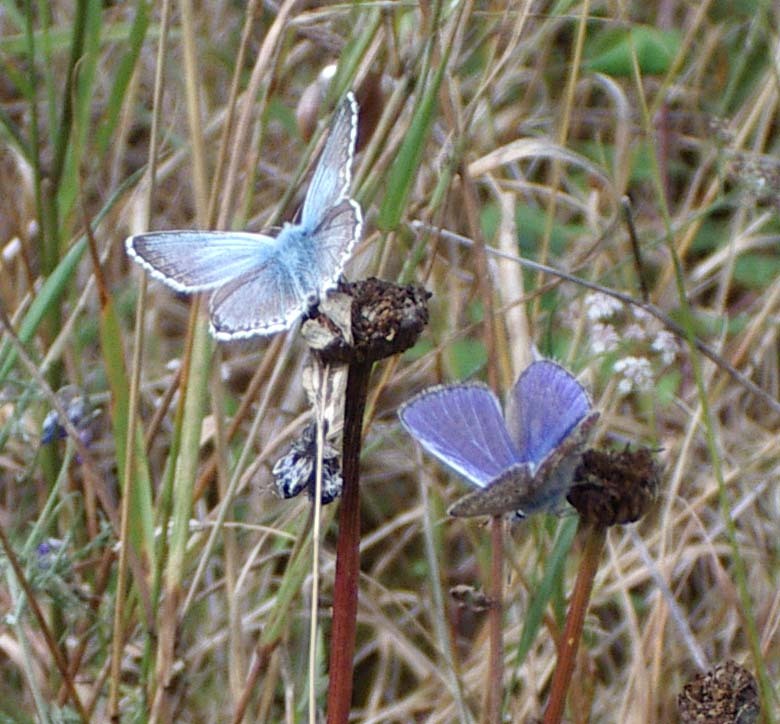 There is a report of a recovery after the cattle were removed and by 1960 there is an authentic report of 6000 Chalkhill Blue Butterflies seen on one day. In 1967 grazing was banned and this resulted by 1971 in a sudden growth of the long grasses, which are now forage harvested in late autumn. Volunteers than helped with scrub clearance but no lasting impression was made on the problem. In the late seventies, I still observed hundreds of Chalkhill Blue butterflies that had descended to the Waterworks Road where the grass was mown, but this area has been neglected and is now covered in nettles. In 1990, cattle were again introduced to the upper slopes for a short period. The area looks very much like a lowland cattle pasture ten years later. 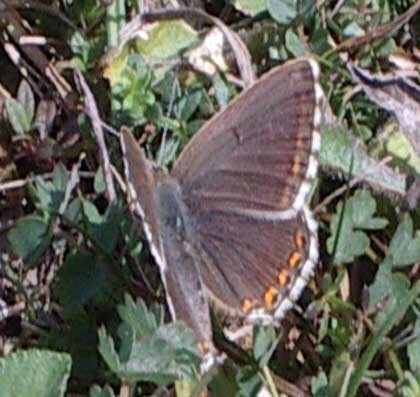 Although the upper slopes now support large populations of many hundreds of Common Blues and Marbled Whites in the longer grasses, this seems to be at the expense of Chalkhill Blues. Erosion has been caused by hang-gliders and other human activities, but it appears that is not as great as the damage caused by cattle. 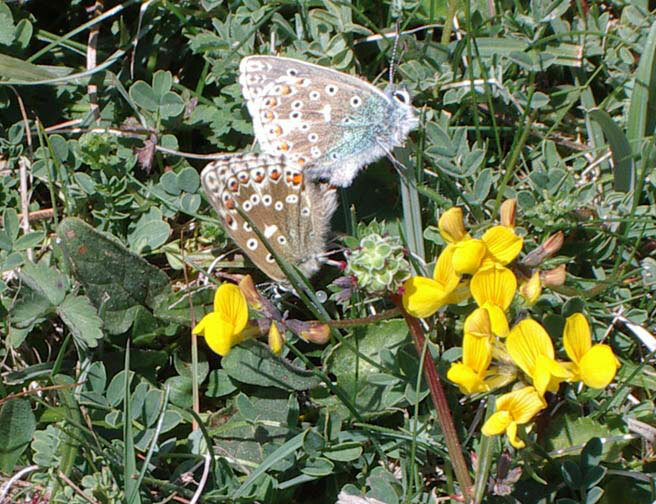 In 2003, my summer survey revealed that Horseshoe Vetch was still abundant on the lower slopes covering only about five acres, but that the same species on the middle and upper slopes is very small in area and does not support Chalkhill Blue Butterflies. Scrub incursions are very serious and a woodland has developed where there used to be bare hill. However, in the main breeding area on the lower slopes is still maintained although the scrub is making serious incursions, led by Wild Privet. 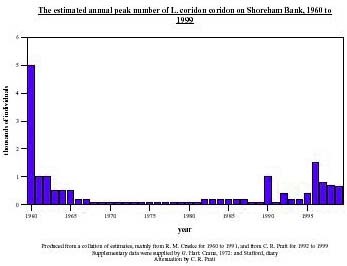 The numbers of Chalkhill Blues seen on one day was 3000, which roughly corresponded to previous years, but this represents about one half of the number for 1960. Only one other day in 2003, I estimated the peak numbers at 2000. The only major management change in this time has been cattle grazing. These are human observations and if the observers miss the date of emergence, the numbers will vary considerably. My main criticism is the missing of the abundance in the early eighties (1981-2) when I would conservatively* estimate the peak numbers to be in excess of 4000. Altogether at least 25 species of butterflies have been positively been identified by myself in the last three years, and I expect this total to increase to 30 or more as this number have been found in the town of Shoreham including Mill Hill. 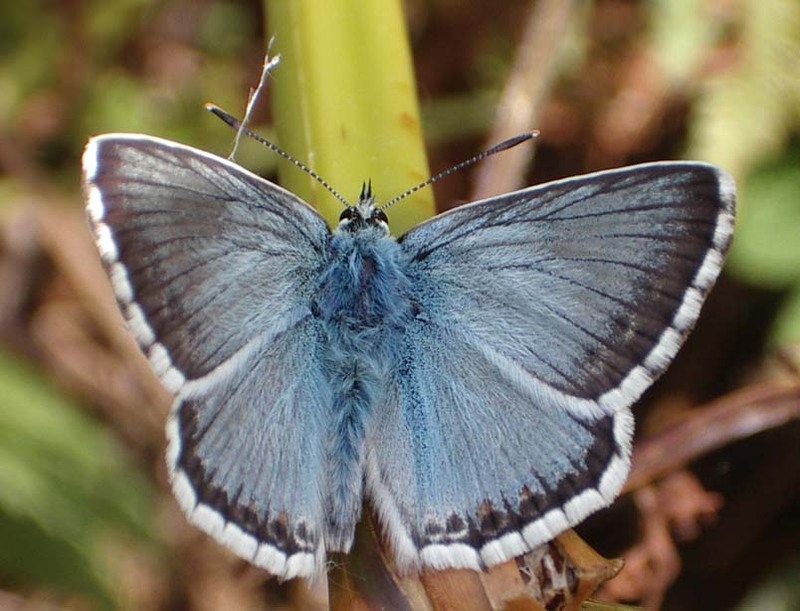 In season the Chalkhill Blue still remains the most prevalent butterfly, with small population of Adonis Blues and slightly larger populations of Dingy Skippers, mostly on the lower short ward (20 mm to 35 mm) herbland. Large numbers of Common Blues and Marbled Whites are to be found on the upper slopes and these will most likely to be seen by casual visitors, although the dispersals of Chalkhill Blues will venture over the whole area in the search for nectar plants. Mill Hill is now managed by the South Downs Conservation Board, who have taken over from the West Sussex County Council. 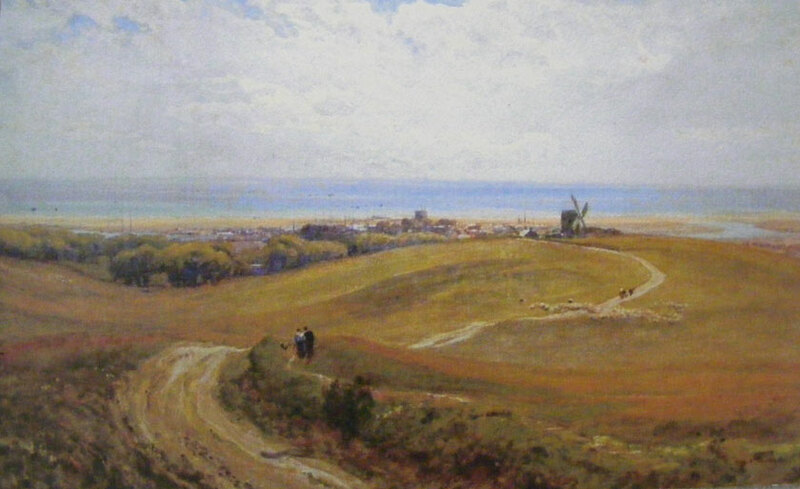 Mill Hill: Watercolour painting by Robert Thome Waite RWS painted in 1867 and presented to the Marlipins Museum in honour of Henry Cheal in appreciation of his work.